New York, New York (April 5th 2012) With the indie soul music scene steadily paving its way through the rough, it is inevitable that different platforms will flourish in order to give these burgeoning artists a place to share their artistry with the masses. Out of this need surfaced Rock Paper Soul, the brainchild of Speek Greene and contributing partner Richard Johnson. Both have the expertise of promoting, DJing and producing respectfully, under their belt. By bridging they’re talents together with their love for music, Rock Paper Soul is geared up to bring you the indie soul experience that has long been talked about, but never produced – until now. Rock Paper Soul presents a stage solely for indie artists to showcase their work for an audience who loves, respects, and are fans of the indie soul genre. 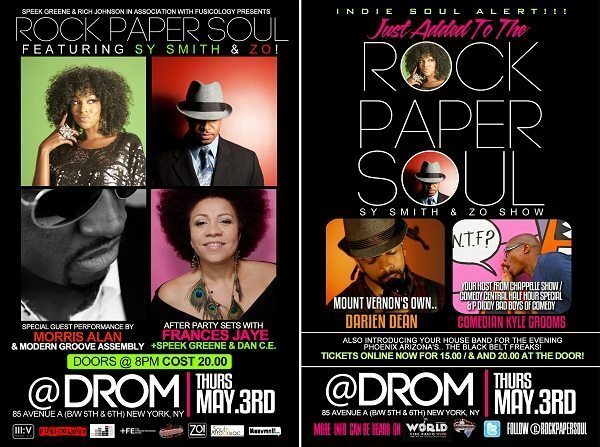 Securing a place for opened minded and upscale music lovers, Rock Paper Soul will be taking place in Manhattan at DROM NYC May 3, 2012. All artist submissions will be prescreened, to achieve the most enjoyable show and ambience for Rock Paper Soul clientele. 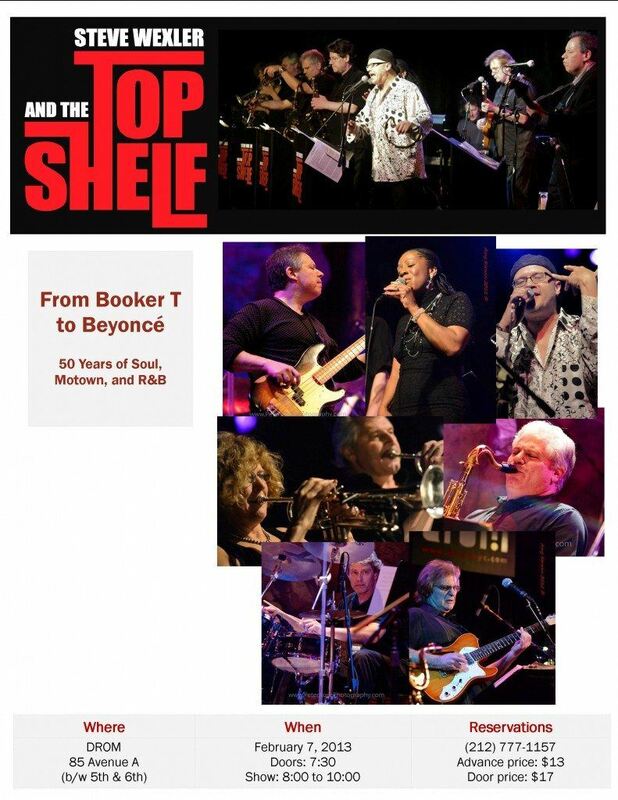 New York City boasts a large following, when it comes to indie soul concerts and events. Everyone comes from near and far – Brooklyn, Manhattan, Harlem,Westchester County, Connecticut and New Jersey. The energy created by the spectacular performances from the roster of indie soul artist on the horizon, will parlay into Rock Paper Soul becoming the trusted event known not only in Manhattan but throughout the neighboring boroughs and beyond. This edition of Rock Paper Soul will feature Sy Smith & ZO! along with Morris Alan & Darien Dean backed by the Black Belt Freaks. 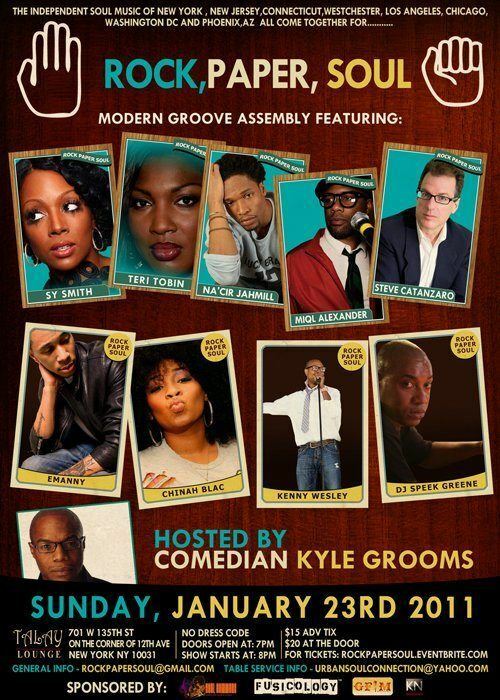 The event will be hosted by comedian Kyle Grooms. Each artist in their own right will leave you with a soulful experience that will leave you wanting for more. Francis Jaye of neosoulcafe.com, DJ Dan C.E. and Speek Greene will be providing a musical backdrop for the night. Sy Smith & ZO! have made their rounds in the indie soul scene for years. Both are contributors to the grammy nominated group The Foreign Exchange. Sy Smith as a vocalist and ZO! as a producer and instrumentalist. Sy Smith’s fouth installment is entitled “Fast And Curious” which features production by Ali Shaheed Muhameed, Nicolay, and James Poyser. She has also worked with other outstanding artist such as Me’shell N’degeocello, Whitney Houston, Chris Botti, Chaka Khan, and more. In 2010 ZO! “Sunstorm” which features artist such as Sy Smith, Eric Roberson, Phonte, Jessie Boykins and Yahzarah. In 2011 he released his latest EP titled “Just Visiting Here” featuring indie soul artist such as Anthony David, Nicholas Ryan Grant and Jeanne Jolly. Morris Alan is armed with one of the most unique & compelling voices to grace the music landscape in a long time. Morris is one that needs to be heard to be believed. Drawing comparisons and being influenced by the likes of music legends, Luther Vandross, Marvin Gaye, Stevie Wonder & more. Morris takes those influences and carves out a style that all who hear describe as “One of the most incredible vocal gifts I’ve heard in a long time”. Darien Dean is an artist with a purpose who hails from Mount Vernon, New York. Fed a healthy diet of Hip Hop and Classic Soul, this multi-talented MC, singer, and dancer, honed his abilities as a producer, arranger and engineer to craft a more authentic approach to contemporary songwriting. A natural born entertainer, Darien’s spirited musical style earned him a coveted spotlight at the 2010 Soul Beach Music Festival in Aruba, opening for Mary J. Blige and won the Budweiser Superfest Battle for the Crown. His latest release is titled “If These Walls Could Talk” on Righteous Music. 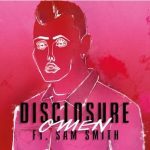 He recently released a video for his newest single “Composure”. Rock, Paper, Soul: Bringing An Indie Experience!! Darien Dean DROM Kyle Grooms Morris Alan Sy Smith Zo!